Toadette: Treasure Tracker is an Event Course in Super Mario Maker, released on March 17, 2016. It unlocks the Toadette Mystery Mushroom costume upon completion. The level begins near an area with Skewers and a Key Door with a Boo near it. 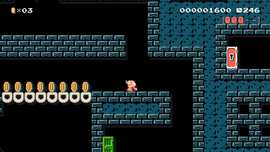 Mario must traverse a maze of Warp Doors to collect all of the Pink Coins and open the Key Door, leading directly to the Goal Pole. This page was last edited on August 31, 2018, at 23:26.